Stock status is current as of 4/25/2019 10:17 AMET. Install your equipment with the CyberPower Rackmount UPS. 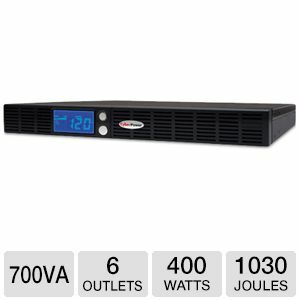 This 700VA, 400W UPS provides 11 minutes half load runtime and 3 minutes Full Load Run Time, enough time to retrieve all necessary data and properly shut down the system before complete power loss. This UPS provides an ultimate solution to datacenters, computer rooms and network closets that uses advanced networking applications during blackouts, voltage fluctuations and transient surges. To protect your electronic devices from damage due to undervoltage and overvoltage, this UPS comes with Automatic voltage regulation feature that maintains the voltage into a 120v nominal output. This UPS is equipped with LCD panels so you can monitor the battery level and power failure conditions. 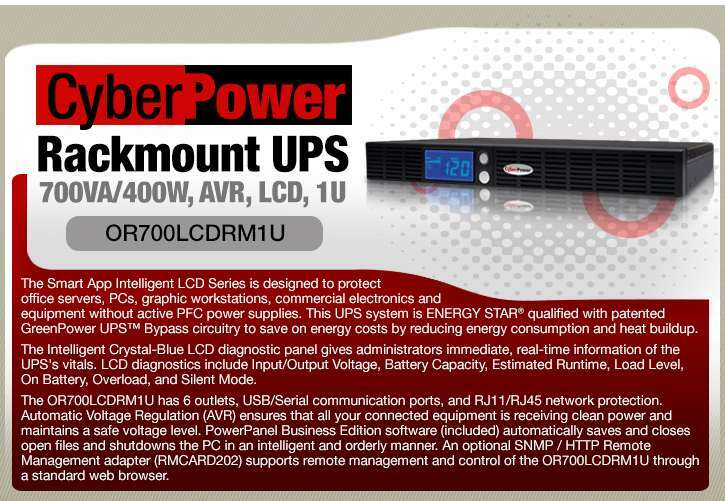 Buy the CyberPower Rackmount UPS today! 17" x 9.25" x 1.75"